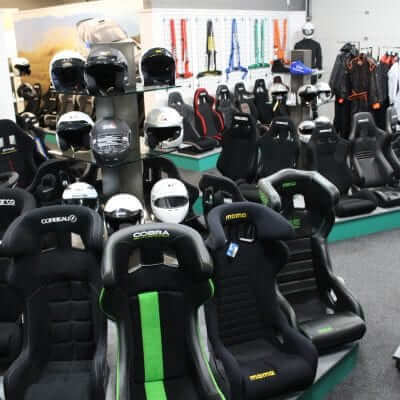 In-store, we display our primary driver safety products including 125 bucket seats, harnesses, helmets, race suits, boots and gloves. We feel providing you the ability to try each product is key in helping you to make the right choice and keep you racing safe. On arrival you’ll meet one of our experts who will quickly access your requirements which will be matched with your body shape allowing us to provide you with a range of independent and unbiased recommendations. Everyone is a different height and weight. Our body structures are different and how we feel in a seat is different for everyone. With that in mind trying our range of over 125 seats is key to making the right decision. We have our Pro-Fit zone just for this purpose. 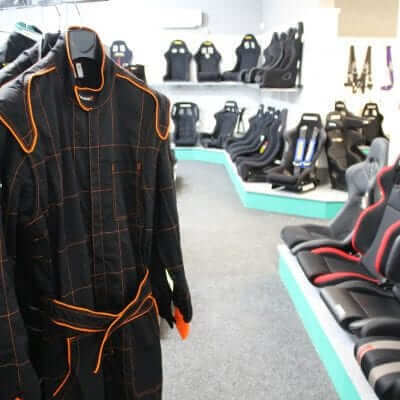 With our in-store roll bar and Motorsport seat setup, you can get your seating position right before securing yourself with our 4-point and 6-point harness belt systems. The angle and fitment of your harnesses is just as important as the seat you’ve choosen. With your seat and harnesses selected. We’ll then explain the features and benefits of using the HANS and Hybrid systems available. Each one is right for different Motorsport activities. So getting that right is key for a comfortable race. We’ve got you covered with our new extensive race-wear collection. 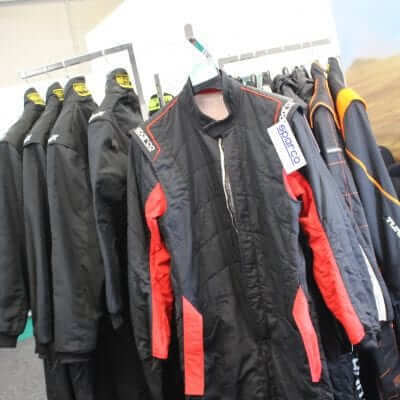 Use our showroom’s changing facilities to try on all of our race-wear, ranging from racing shoes & helmets through to racing gloves & Nomex underwear from all of the industry-leading brands. Once you’ve decided what you want, we’ll create a total package for all of your safety equipment. The importance of sitting correctly, having your harnesses at the right angle and in the correct position through the harness slots of the seat is critical to the difference between walking away from an accident or being injured. If you’re not sure if your current set up is correct then we’ll check for free. 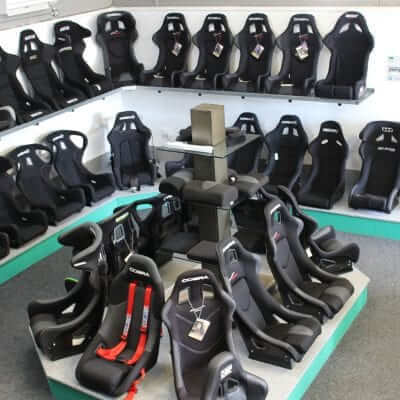 Working closely with a range of our suppliers including Cobra & Corbeau, we are able to help you design the right seats for your requirements. Whether you want a fully customised Motorsport seat with team logos, or a diamond quilted seat for your road car, we’re here to help. Our wide array of steering wheels from brands including OMP, MOMO, Sabelt & more will provide you with exceptional grip & control of your vehicle, allowing you to shave seconds off your lap time in style. 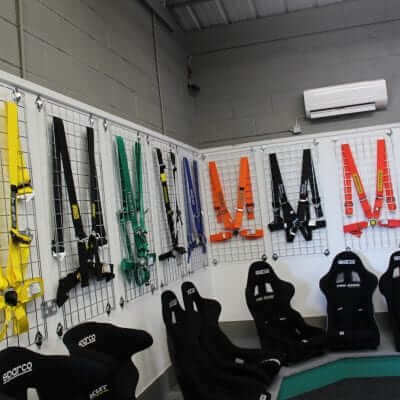 We work with key brands from Safety Devices and Custom Cages through to Sparco and OMP. Getting the right track day, MSA or FIA roll cage is critical for every driver. We’ll provide the best recommendations for you. We have a range of big brake kits on display. Brakes are available with hundreds of variations in size and specification. We’ll work with you to match the right brake kit to your car based on power, weight and wheel size. If you’re part of a football club, rugby team or any other association that requires a custom, dugout or even waterproof seating arrangement then you’ve come to the right place. With our extensive range of luxury seats, exactly for these projects, from our premium manufacturers, we can provide seats that are fully customised to your club’s colours and suitable for any outdoor weather conditions. If you’re looking for some water resistant seats for your marine vessel, we’ve got a unique range of fibreglass shell bucket seats with specialist vinyl covers made entirely for this purpose. From track day enthusiasts to professional race drivers. We’re here to put you first.